Saturday, January 24, 1835.Vandalia, IL. Lincoln's first bill, "act to limit the jurisdiction of Justices of the Peace," passes 39 to 7. "Act for the relief of debtors of the State Bank of Illinois" is referred to select committee composed of Lincoln, Dunn of Pope, and Harris of Macoupin.House Journal. Tuesday, January 24, 1837.Vandalia, IL. House debates internal improvement bill. Lincoln votes yea on amendments adding improvements, and against motion to donate, out of first money obtained by loans under act, grant of $25,000 to each county for schools.House Journal. Thursday, January 24, 1839.Vandalia, IL. House discusses resolutions relative to examination of affairs of state bank at Springfield and Bank of Illinois at Shawneetown. They table resolutions 47 to 32. Lincoln and Dawson oppose investigation, and Calhoun, Elkin, and McCormick of Sangamon favor it.House Journal. Friday, January 24, 1840.Springfield, IL. Lincoln reports bill from finance committee authorizing purchase of house for governor. On his motion, appropriation bill is made special order of session at 7 P.M. On his motion, rule is dispensed with and bill to change name of Dane County to Christian is passed.House Journal. Monday, January 24, 1842.Springfield, IL. Lincoln writes out a statement concerning the bank accounts of his former law partnership with John T. Stuart and of his current practice with attorney Stephen T. Logan. After transferring funds from the Stuart-Lincoln account into the Lincoln-Logan account, Lincoln cannot reconcile an $11.29 positive balance. Regarding the surplus, Lincoln writes that he does not know "exactly to whom it belongs." Lincoln notes that he has "put [the money] in my pocket, holding myself responsible to whomever may hereafter prove to be the owner." Memorandum, 24 January 1842, Private Collection; Memorandum Concerning Bank Account of Stuart & Lincoln, 24 January 1842, CW, 1:267. Tuesday, January 24, 1843.Springfield, IL. Mason v. Park (SC), appeal from Richland, is argued before court by Ficklin for plaintiff and Lincoln for defendant, and case submitted. On February 11, 1843 case is remanded to Circuit Court with costs against appellee.Record. Lincoln attends evening meeting of people interested in temperance.Photocopy. Wednesday, January 24, 1844.Springfield, IL. Lincoln draws up affidavit of Henry Dresser, contractor. Dresser swears he has done $60 worth of carpenter work for Dorthea Grant and that she has left state.Photocopy; Sangamo Journal, 15 February 1844. 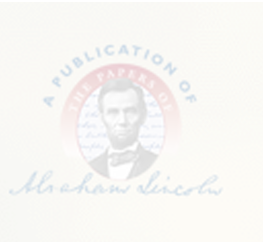 Lincoln files abstract in Warner & Craig v. Helm et al.Record. Friday, January 24, 1845.Springfield, IL. In J. Charles Stickney & Co. v. Cassell, from Gallatin County, plaintiff is given leave to amend his assignment of errors. W. H. Stickney appears for plaintiff, and Lincoln, who writes and signs reply to petition, for defendant. Record; Herndon-Weik Collection, Library of Congress, Washington, DC. Saturday, January 24, 1846.Petersburg, IL. Lincoln spends this day and tomorrow in Petersburg campaigning for Congress.Abraham Lincoln to Benjamin F. James, 27 January 1846, CW, 1:359-60. Monday, January 24, 1848.Washington, DC. Lincoln introduces petition of John Dawson praying remuneration for his services as acting pension agent in Illinois for three years during Tyler's administration. Journal. Barrow of Tennessee speaks on administration's war policy, claiming that war was unnecessary, and criticizing Polk's request for additional troops. Dixon of Connecticut defends Ashmun's resolution.Globe. Friday, January 24, 1851.Springfield, IL. In Supreme Court Harris v. Shaw et al. is tried by Edwards for plaintiff and Purple for defendants. Lincoln is also counsel for plaintiff, who gave property in public square at Tremont to Tazewell County on condition of county seat's being there and now sues for recovery because of removal to Pekin. Tazewell Circuit Court found for defendants. Record. Saturday, January 24, 1852.Springfield, IL. Judge Drummond gives his opinion in Peoria Bridge Case, tried in federal court December 19, 1851 and December 20, 1851. He decides that legislature has no right to authorize obstruction of navigable stream. Question whether Peoria bridge is, in fact, obstruction is to "be settled by testimony on trial." Register, 27 January 1852. Case is later compromised. McLean's Reports, VI, 209. Monday, January 24, 1853.Springfield, IL. Lincoln and 38 others write to Dr. Smith: "The undersigned having listened with great satisfaction to the discourse, on the subject of temperance, delivered by you on last evening, and believing, that, if published and circulated among the people, it would be productive of good; would respectfully request a copy thereof for publication." Abraham Lincoln to James Smith, 24 January 1853, CW, 2:188. Wednesday, January 24, 1855.Springfield, IL. First train to reach Springfield in four days comes in from Alton. Snowdrifts continue to bar entrance from north. Illinois Journal, 25 January 1855. Thursday, January 24, 1856.Springfield, IL. In Supreme Court argument is commenced in Moore & Munn v. Vail for use of Melick, appeal from Morgan County, ejectment. D. A. Smith of Jacksonville opens argument for appellants. Record. Saturday, January 24, 1857.Springfield, IL. Lincoln is occupied in Supreme Court entire day. Representing plaintiff in error, he moves that Busher v. Lewis be dismissed. Following that, McConnel v. Delaware Mutual Safety Insurance Co., before court in 1856, is reargued. Appellants argue orally, but Lincoln and Dummer for appellees file written arguments. Court decides case in their favor. Record. Tuesday, January 24, 1860.Springfield, IL. Lincoln writes J. W. Sheahan, editor of Chicago "Times" and strong Douglas supporter, denying that he had revised "in any just sense of the word," his debates prior to publication. "I only made some small verbal corrections, . . . not feeling justified to do more, when republishing the speeches along with those of Senator Douglas—his and mine being mutually answers and replies to one another." Abraham Lincoln to James W. Sheahan, 24 January 1860, CW, 3:515. Thursday, January 24, 1861.Springfield, IL. George G. Fogg, secretary of Republican National Executive Committee, returning to Springfield monopolizes Lincoln's time throughout day. His visit relates to selection of New England member of cabinet and action of Republican congressmen upon compromise propositions. N.Y. Herald, 25 January 1861. Committee of Central Republican Club of Philadelphia visits Lincoln to urge Sen. Cameron's (Pa.) appointment to cabinet. Smith to Cameron, 24 January 1861, Simon Cameron Papers, Library of Congress, Washington, DC. Lincoln replies: "I have every reason to hope that your wishes will be gratified." Remarks to a Pennsylvania Delegation, 24 January 1861, CW, 4:179-81. Again waits in vain at station for arrival of Mrs. Lincoln and Robert. Villard, Eve of '61, 54-55. Friday, January 24, 1862.Washington, DC. Lincoln authorizes Secretary of War Edwin M. Stanton to make desired changes in Bureau of Ordnance. Stanton to Lincoln, 24 January 1862, Elihu B. Washburne Papers, Library of Congress, Washington DC; Abraham Lincoln to Edwin M. Stanton, [24 January 1862], CW, 5:110. Consults with E. Delafield Smith, U.S. district attorney in New York, who favors noninterference by President in case of Capt. Nathaniel Gordon, sentenced to be hanged for slave trading. Evening Star (Washington, DC), 28 January 1862, 2d ed., 2:3. Submits to Senate correspondence in case of Spanish vessel Providencia seized by U.S. blockading squadron. Abraham Lincoln to the Senate and House of Representatives, 24 January 1862, CW, 5:109-10. Requests advice of Senate on loan to Mexico. Abraham Lincoln to the Senate, 24 January 1862, CW, 5:109. Saturday, January 24, 1863.Washington, DC. President poses for photographs by Alexander Gardner, M. B. Brady's assistant. LL, No. 211. Group of Boston antislavery men, including Wendell Phillips, calls on Lincoln, who excuses himself until next day. Moncure D. Conway, Autobiography, Memoirs, and Experiences of Moncure Daniel Conway, 2 vols. (Boston: Houghton Mifflin, 1904), 377-82. California committee meets with cabinet to discuss gauge of Pacific railroads. Welles, Diary. "The reception at the Executive Mansion to-day by the President and Mrs. Lincoln was unusually well attended." New-York Herald, 25 January 1863; Daily National Republican (Washington, DC), 24 January 1863, 2d ed., 2:5. Mrs. Lincoln grants interview to Wendell Phillips. Moncure D. Conway, Autobiography, Memoirs, and Experiences of Moncure Daniel Conway, 2 vols. (Boston: Houghton Mifflin, 1904), 377-82. Sunday, January 24, 1864.Washington, DC. Dinner party at White House includes O. H. Browning, Sen. Sumner (Mass. ), former Cong. Ashmun (Mass. ), Gen. George D. Ramsay and Gen. Schenck (resigned), and Congs. Garfield (Ohio) and Samuel Hooper (Mass.). Browning, Diary.